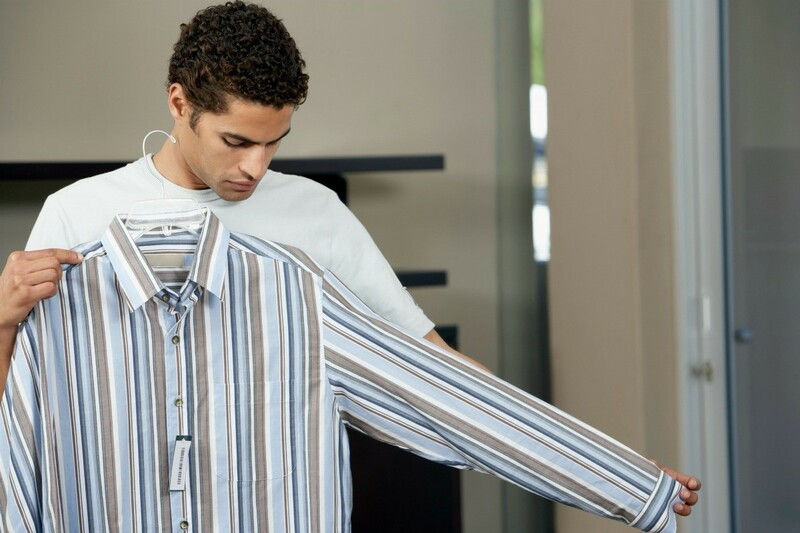 Altering the length of sleeves can add extended wear and save you money. This guide is about shortening men's shirt sleeves. I am altering men's shirt sleeves from long to short. They are definitely tapered. Help please! I did that when my husband's long sleeve shirts got grease on the bottom of the sleeve. I just took one of his "store bought" short sleeve shirts and laid it flat on top of his long sleeve shirt and cut about 1 and 1/2 inch too long. Then machine stitched the long sleeve shirt. He couldn't even tell that I had done it. Thanks for the pointer 'Jean in GA'. When the sleeves are tapered, such as with dress shirts, (the part you are turning up will be narrower than where you will be attaching it) you take in the seam allowance on the line where you will stitch the hem in place. The only solution for this is to use part of the cut off fabric to widen the new short sleeve. Cut a triangular piece to fit in the seam line, it will widen the sleeve and look like a design element. No one will be the wiser. you may have to taper and reshape the hem to fit, usually I measure 10" from the shoulder draw my hem line with chalk, leave a 1 1/2 hem hem allowance to be turned under once for a nice finish. You can then judge if you split the seam if you can make it fit, press the hem allowance up. It usually works just fine. My husband's long sleeve shirts are always too long. Is it possible to shorten the sleeves myself? It is a difficult job. The cuffs have to be removed, the sleeve shortened, and the sleeve eased back in to the cuff. If you are a good seamstress you can unset the sleeves and reset them. You would have to carefully pick seam open at armhole, measure exact amount of length plus 1/2 in seam allowance. You would need exact thread match to re-stitch. Don't trim excess until you are sure you have it right Hopefully your machine has a drop arm to make it easier. If you pin carefully and baste before final stitches you can check length and adjust you can do it!! Well - I have done a lot of sewing over the years but I'm not sure that I would want to tackle this project. If you have done alterations in the past, you may be able to follow Pghgirl's instructions and do a good job. I have always felt that alterations were one of the more difficult projects to take on but many do them with no problems so you may be one of those. Why not try it on a shirt you can make into short sleeves (or rags) if it does not go well? Then maybe you can learn what you did wrong and correct it on the second one. My daughter had some clothes that needed alterations and we placed ads in Freecycle, Craigslist, Nextdoor.org asking for help (willing to pay) and met several really nice experienced seamstresses who were very glad to get the work. We still recommend them to other people today. Seems short/small people are always needing alterations on their clothes. Good luck - hope it works out well. Question: How Do You Shorten Men's Shirt Sleeves? How can you shorten men's long sleeve shirts to short sleeves? After cutting off the sleeves my hems end up not being big enough around so they leave little pleats at the seam line. I often take out a small length of the underarm seam where I turn up the hem but that doesn't work to well. I have received about 25 long sleeve shirts and want to shorten the sleeves. Big savings. Are your shirt sleeves tapered? You should be able to cut your sleeve, remember at an angle since the outside of the sleeve is longer than the part under the arm, and hem without any pleating. The only thing I can think of is that the shirt is tapered. I alter all my husbands shirts and have never had a problem. Wish I could be more help. If you are using a machine to do the hemming, try placing the outside of the sleeve on the bottom against the feed dogs. The inside of the sleeve will be facing up towards you. This will allow the feed dogs to ease the fabric as you go around the sleeve.